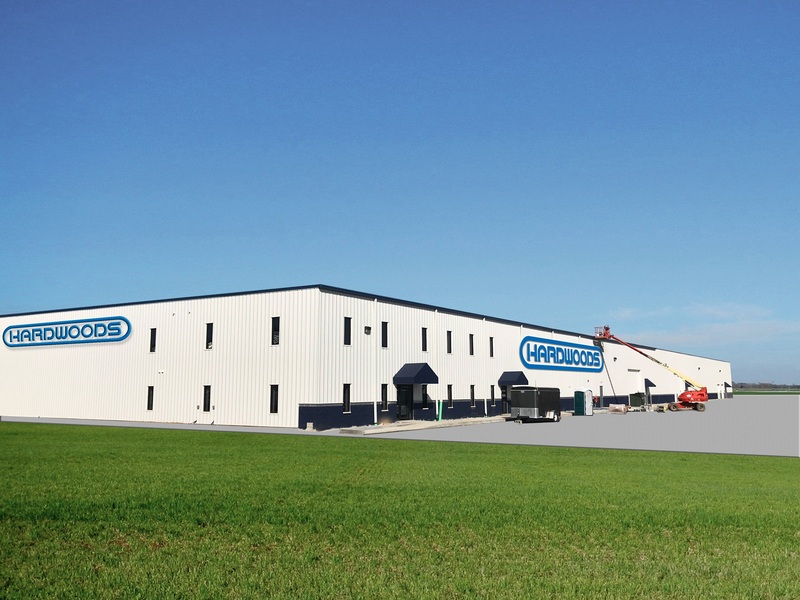 BRASELTON, Ga. - Hitachi Power Tools newest finish nailer lineup includes battery powered cordless models with brishless motors: the NT1850DE 18-Gauge 2-inch cordless brad nailer, the NT1865DM 16-Gauge 2-1/2” cordless straight finish nailer, and the NT1865DMA 15-Gauge 2-1/2” cordless angled finish nailer. Hitachi offers what it says is a unique lifetime tool warranty on cordless products. This series is powered by Hitachi’s New upgraded Compact 3.0Ah Lithium Ion battery, model BSL1830C (339782) that has the same capacity as a conventional 3.0Ah lithium ion battery, while the height is shortened by ¾ of an inch and the weight is 0.6 lbs. less (compared to Hitachi battery model BSL1830). Each cordless finish nailer comes with a compact 3.0Ah lithium ion battery. All cordless nailers in this series feature Hitachi Brushless motors for longer run time, less maintenance and increased durability. The driving system used is similar to Hitachi’s pneumatic line featuring a unique air spring drive system that uses compressed air to drive each nail. This results in zero ramp up time, increased shooting speed, recoil that feels like a pneumatic nailer, quicker response time between fastener shots, better flush driving- even at an angle, and easy maintenance if the need should arise due to fewer parts to manage. They come with an on-tool battery charge indicator and tool-less depth-of-drive dial that can be easily adjusted to adapt to woods of varying density for a professional finish. Additionally, each has a selective actuation switch that lets the user select between sequential mode or bump fire mode, when rapid nailing is preferred. A convenient tool-less, easy-to-clear nose makes it quick and simple to extract a nail should one jam during use. An integrated pivoting belt hook adds convenience, and can be adjusted to fit on either side of the nailers (except on NT1865DMA). A no-mar nose cap protects the work surface from markings. The narrow nose pieces help facilitate nail placement in hard to reach areas and tight corners. A built-in LED light on each nailer comes in handy when working low light areas. The ergonomically formed, soft grip handles are designed for comfort during extended use. For added safety, located on the control panel at the base of the handle, is a power button. When activated, the nailer is ready for use. It automatically shuts off power after 30 minutes of inactivity. Also, a side-lock switch is incorporated to prevent accidental firing. All Hitachi Cordless Brushless Finish Nailers come with a Lifetime Lithium-Ion tool warranty, 2-year Lithium-Ion Battery warranty and 1-year Lithium-Ion Charger warranty for ultimate peace of mind. The NT1850DE Cordless 18-Gauge Brad Nailer accepts 5/8” to 2” 18-Gauge fasteners to tackle trim work, furniture assembly and other finish applications. It is capable of driving up to 1,650 nails per charge. 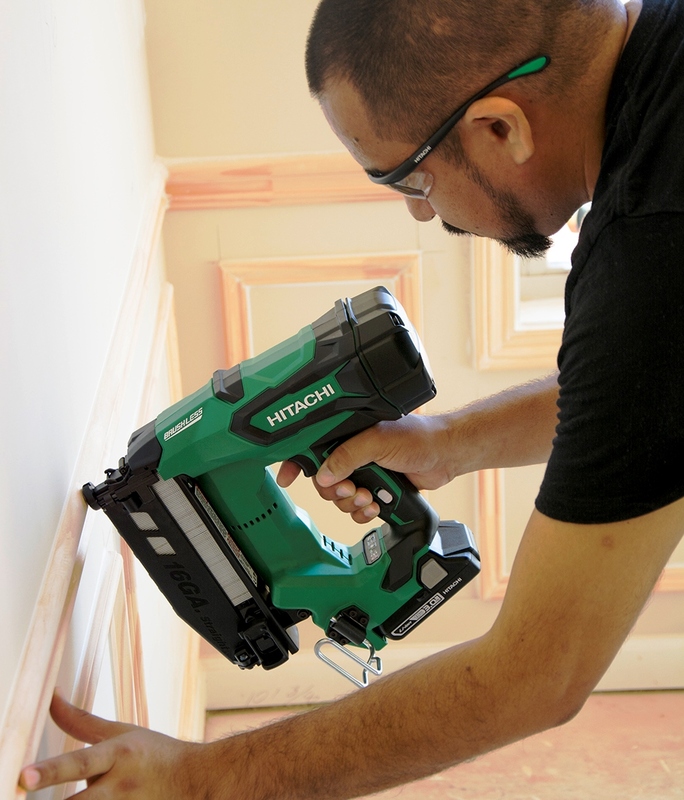 The NT1865DM Cordless 16-Gauge Finish Nailer accepts 1” to 2-1/2” 16-Gauge fasteners to install molding, chair rail, cabinetry and other finish applications. It is capable of driving up to 1,500 nails per charge. The NT1865DMA Cordless 15-Gauge Angled Finish Nailer accepts 1-1/4” to 2-1/2” 15-Gauge angled fasteners to tackle almost any finish project. It is capable of driving up to 1,100 nails per charge. The 34° angle of the magazine allows the user to reach into corners or tight spaces with ease.